Implementation of the Fire Management Support Component for Georgia by GFMC in the frame of the regional programme Integrated Biodiversity Management in the South Caucasus (IBiS) (GIZ) and preparation of the project Fire Management Planning for target Protected Areas in the frame of the Support Programme for Protected Areas – Georgia (KfW) (J.G. Goldammer); Tbilisi, Borjomi and Dedoplistskaro, Georgia. First Workshop of the Thematic Working Group Vegetation (Landscape) Fire Crisis Mitigation (TWG-C) of the project FIRE-IN – Fire and Rescue Innovation Network, a project conducted in the frame of the EU Horizon 2020 Work Programme 2016-2017 Secured Societies – Protecting Freedom and Security of Europe and its Citizens (SEC-21-GM-2016-2017 – Pan-European Networks of Practitioners and other Actors in the Field of Security), chaired by GFMC; Federal German Agency for Technical Relief (Bundesanstalt Technisches Hilfswerk), Berlin, Germany. Meeting and consultations between the Presidents of the Federal German Agency for Technical Relief (Bundesanstalt Technisches Hilfswerk), Albrecht Broemme, the International Association of Fire and Rescue Services (CTIF), Tore Eriksson, and GFMC (Johann Georg Goldammer); Federal German Agency for Technical Relief (Bundesanstalt Technisches Hilfswerk), Berlin, Germany. Planning meeting of the International Liaison Committee (ILC) of the 7th International Wildland Fire Conference (Campo Grande, Brazil, May 2019); Campo Grande, Brazil. Seventh International Convention of Environmental Laureates: “Ecological Foodprint” with GFMC participation; Freiburg, Germany. Consultation and working meeting within the framework of the OSCE project Improving radiological and environmental awareness in territories affected by the Chernobyl accident in Belarus and Ukraine with a focus on wildfire management, with remote participation of project partner GFMC; Ministry of Emergency Situations of the Republic of Belarus, Gomel, Belarus. Working meeting to evaluate the progress of the Study on Currently Available Aerial Forest Fire Fighting Assets at the European Commission, ECHO.A – Emergency Management, A.1 – Emergency Response Coordination Centre (ERCC) (GFMC Contractor); European Commission, Brussels, Belgium. Bilateral fire emergency response exercise between Belarus and Ukraine in the frame of the project Improving radiological and environmental awareness in territories affected by the Chernobyl accident in Belarus and Ukraine with a focus on wildfire management, coordinated by the Organization for Security and Cooperation in Europe (OSCE), the Regional Eastern European Fire Monitoring Center (REEFMRC) and GFMC; Gomel Oblast Department of the Ministry of Emergency Situations of the Republic of Belarus, Gomel, Belarus. 19th Round Table of the European Fire Academy How to deal with major Disasters – What should be the best European response?, with GFMC contribution Landscape Fires; Directorate General Security and Prevention, Brussels, Belgium. Regional Round Table and Consultation Enhancing Regional Cooperation in Fire Management in South East Asia, organized by the Ministry of Environment and Forestry, Republic of Indonesia, the Regional Fire Management Resource Center South East Asia (RFMRC-SEA) and GFMC; Ministry of Environment and Forestry, Manggala Wanabhakti, Jakarta, and RFMRC-SEA, Bogor Agricultural University, Indonesia. Implementation of the Fire Management Support Component for Georgia in the frame of the regional programme Integrated Biodiversity Management in the South Caucasus (IBiS) (GIZ): Training course for fire management personnel in Kakheti region (Akhmeta and Dedoplistskaro Districts (GFMC contractor); Kakheti / Akhmeta and Tbilisi, Georgia. 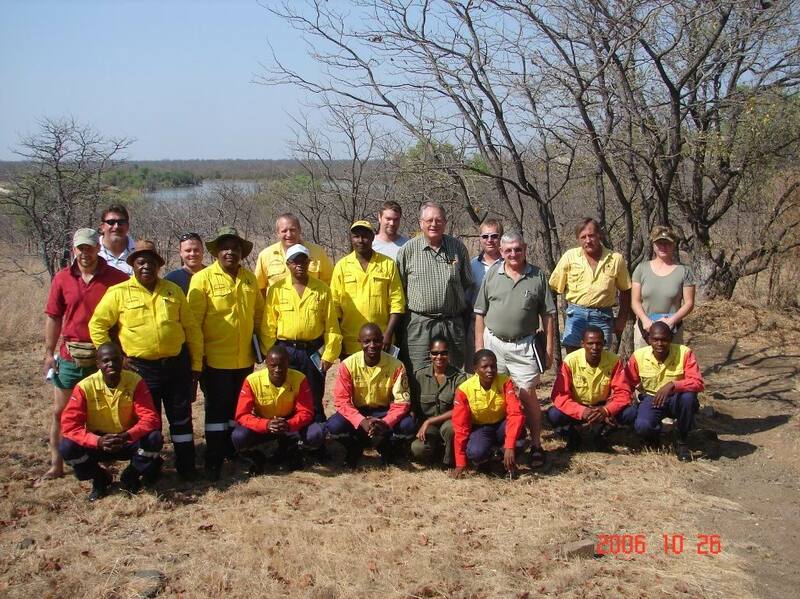 Second GFMC field mission and community-based fire management training in the frame of the forest rehabilitation project of Lernen-Helfen-Leben e.V. in Democratic Republic of Congo; South Kivu Province (Regions Burhinyi, Luhwinja, Kaziba, Mushenyi and Nyangezi) D.R. Congo. Workshop of the project FIRE-IN – Fire and Rescue Innovation Network, a project conducted in the frame of the EU Horizon 2020 Work Programme 2016-2017 Secured Societies – Protecting Freedom and Security of Europe and its Citizens (SEC-21-GM-2016-2017 – Pan-European Networks of Practitioners and other Actors in the Field of Security), with public presentation of the Thematic Working Group Vegetation (Landscape) Fire Crisis Mitigation (TWG-C) chaired by GFMC; Istituto Superiore Antincendi, Rome, Italy. Asian Ministerial Conference on Disaster Risk Reduction (AMCDRR), with joint presentations of the GFMC, the Regional Fire Management Resource Center – Central Asia Region (RFMRC-CAR) and the Regional Fire Management Resource Center – South East Central Asia (RFMRC-SEA), with contribution in the Side Event on Forest Fire-Related Risks on Challenges and Progress made in National Capacity Building in Landscape Fire Management in the Asian Region and at Global Level: Towards the Implementation of Target E of the Sendai Framework and presentation of the joint statement Current and Future Consequences of Fires Affecting the Landscapes of Asia: Call for Regional and Global Action to Reduce the Adverse Impacts of Fire on the Environment and Society; Ulaanbaatar, Mongolia. Meeting between the head of GFMC and Prime Minister of Greece, Mr. AlexisTsipras, on the establishment and the modus operandi of the “Committee on the Future of Landscape Fire Management and Wildfire Risk Reduction in Greece”; Maximos Mansion, Athens, Greece. Joint meeting with the Secretariats of Organization for Security and Cooperation in Europe (OSCE), the Council of Europe’s European and Mediterranean Major Hazards Agreement (EUR-OPA), the United Nations Office for Disaster Risk Reduction / UNISDR and the Global Wildland Fire Network / Global Fire Monitoring Center (GFMC) “Streamlining International Cooperation in Landscape Fire Management: Development of a Joint Agenda between UNISDR, Council of Europe (EUR-OPA), OSCE and the Global Fire Monitoring Center (GFMC)” (J.G. Goldammer); Office of the Coordinator of OSCE Economic and Environmental Activities (OCEEA), Vienna. Meeting of the preparatory mission for the development of a tri-lateral project between Ecuador, Brazil and Costa Rica, with the support of Germany “Strengthening Technical and Institutional Capacities in Ecuador in Integrated Fire Management in Conservation Areas” (Misión de Preparación de la Propuesta Cooperación Trilateral Ecuador – Brasil – Costa Rica – Alemania: “Fortalecimiento de las Capacidades Técnicas e Institucionales en el Ecuador para el Manejo Integral del Fuego en Áreas de Conservación”); with online participation of the GFMC, Quito, Ecuador, and Freiburg, Germany. Meeting of the CTIF Forest Fires Commission of the International Association of Fire and Rescue Services (Comité Technique International de prevention et d’extinction de Feu – CTIF) with GFMC participation; Sessa, Ticino, Switzerland. International Conference on Culture Against Disasters: Protecting Cultural Landscapes as Prevention of Natural Disasters, with GFMC contribution “Wildfire Risks and Fire Use in Changing Cultural Landscapes: Underlying Causes, Challenges and Options for Integrated Landscape Fire Management in a Green Economy” on behalf the European Major Hazards Agreement EUR-OPA; Ravello, Italy. Meeting of the International Liaison Committee (ILC) and the Brazilian Conference Organizing Committee for the 7th International Wildland Fire Conference in conjunction with the meeting of the UNISDR Wildland Fire Advisory Group (WFAG); GFMC, Freiburg, Germany. Joint Meeting of the Committee of Permanent Correspondents and Directors of Specialised Centres, European and Mediterranean Major Hazards Agreement (EUR-OPA), with GFMC report on the 2018 achievements in the establishment and launching of work of the Eurasia Team of Specialists on Landscape Fire Management; Zagreb, Croatia. National Round Table on the Future of Landscape Fire Management in Greece, convened by the Committee on the Future of Landscape Fire Management and Wildfire Risk Reduction in Greece” (GFMC Chair) and the Office of the Prime Minister of Greece; Athens, Greece. Regional Workshop Landscape Fire Management in South Eastern Europe, organized by the Regional Fire Monitoring Center For SE Europe / Caucasus (RFMC) and GFMC, on behalf of the Office of the Coordinator of OSCE Economic and Environmental Activities, with the topics: (a) Review of the state and need for further development of national and regional early warning systems, fire management information systems and exchange of data and information at regional SEE level; (b) Review of national fire management systems: Current situation, policies and inter-agency cooperation; (c) Needs for future building and strengthening of volunteer firefighting services; (d) Strengthening national and cross-boundary fire management capacities for complementing and increase effectiveness of the EU Civil Protection Mechanism in the SEE neighborhood; (e) Fire management on terrain contaminated by unexploded ordnance (UXO) and land mines, and (f) Discussion on modalities for strengthening the regional co-operation on Fire Management; Hotel Solun, Skopje, the Former Yugoslav Republic of Macedonia. The GFMC and the Chilean authorities decided to follow up the First Regional Symposium on Cross-Boundary Cooperation in Fire Management in South America / Primer Simposio Regional de Cooperación en Manejo del Fuego Inter-Fronterizo en Sudamerica (held in Uruguay in May 2016) and to convene a second regional consultation. Country representatives from nine South American countries (Argentina, Bolivia, Brazil, Chile, Ecuador, Paraguay, Peru, Uruguay and Venezuela) agreed on the “Viña del Mar Declaration on Cross-boundary Cooperation in Fire Management”. Photo: CONAF. Aaron Cavieres, Executive Director of Corporacion Nacional Forestal (CONAF) opened the consultation. Photo: CONAF. Signing of a cooperation agreement between CONAF (A. Cavieres) and GMFC (J.G. Goldammer). Photo: CONAF. The GFMC will support a number of participants from SADC Countries. Reproductionand dissemination of material in this publication for educational or othernon-commercial purposes are authorized without any prior written permission fromthe editors. Reproductions of the material in this publication for resale orother commercial purposes is prohibited without written permission of editors.